​For weeks, Harbor City Narbonne Coach Manuel Douglas has been exhorting his team to avoid complacency as the Gauchos routed one opponent after another. 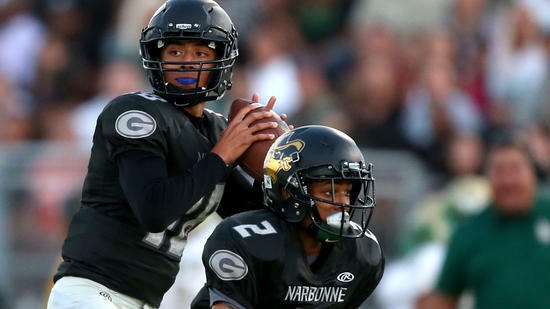 The reward came Saturday when Narbonne (8-2) was seeded No. 1 for the City Section Division I football playoffs. Lake Balboa Birmingham (7-3) is No. 2, followed by No. 3 Garfield (8-2) and No. 4 Dorsey (5-5). "That's the thing we've been fighting all year long," Douglas said, "and I keep reminding our team. The emphasis is on playing at a high level." The bad news for opponents is that Narbonne is injury free. Even running back Justin Franks, sidelined since Narbonne's third game of the season against Gardena Serra, has returned. First-round games are set for Friday. Narbonne will host Northern League champion Eagle Rock (6-4), the No. 16 seed. Among the best openers are No. 9 South Gate (8-2) at No. 8 San Pedro (6-4), No. 12 Sylmar (8-2) at No. 5 Taft (8-2) and No. 10 Venice (5-5) at No. 7 Arleta (10-0). Los Angeles (9-0-1) is the No. 1 seed in Division II, with Belmont (10-0) No. 1 in Division III. The City finals will be Dec. 5 at Cerritos College. For the first time since 1979, Long Beach Poly won't be in the Southern Section playoffs. The Jackrabbits (4-6) had to forfeit four victories because of an ineligible player, then lost out in a tiebreaker procedure to determine third place in the Moore League and a Pac-5 Division playoff berth. Three schools that tied for third place were put into an envelope Friday night. The first school name pulled from the envelope was eliminated, and that was Poly. Long Beach Jordan won out over Long Beach Cabrillo because of a win in the head-to-head matchup. There are two at-large berths available in the Pac-5 that will be announced Sunday morning, and Westlake Village Westlake (7-3) and West Hills Chaminade (7-3) appear to be the leading candidates. Among the noteworthy regular-season final games Friday, Pasadena won its first game over rival Muir in 20 years with a 13-6 victory. Chaminade upset Gardena Serra, ranked No. 3 by The Times, 38-21. Senior receiver Jordan Chin had 10 receptions for 154 yards and one touchdown. Dymond Lee completed 23 of 33 passes for 278 yards. Sophomore T.J. Pledger rushed for 144 yards and scored three touchdowns. Los Angeles Loyola (8-2), the third-place finisher in the Mission League, will be without sophomore linebacker Jackson Sirmon (10 sacks) in the Pac-5 playoffs after he suffered a knee injury on Friday night jumping up and down celebrating. 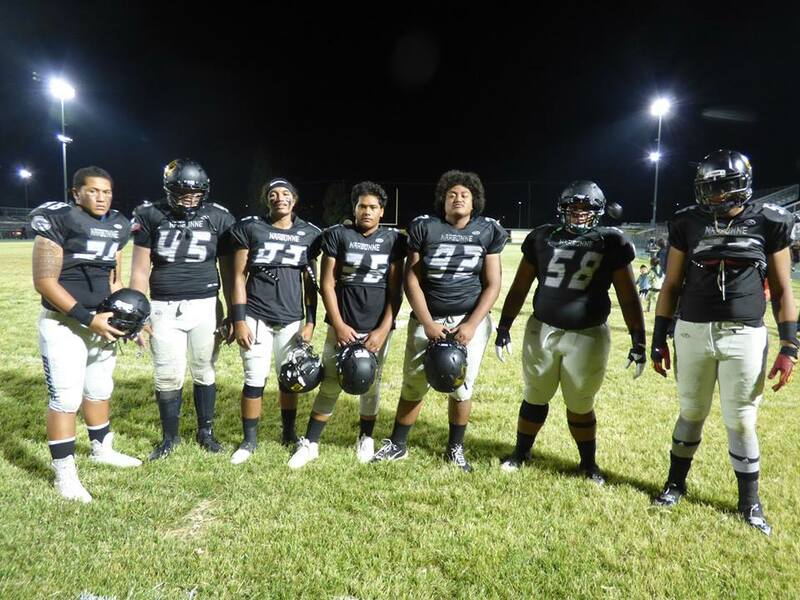 The-stars-were-out' Thursday-night to see the Narbonne High School Gauchos host the Jackrabbits of Long Beach Poly. UCLA Football coach Jim Mora joined several college players to watch an epic early-season struggle between the two top teams. But even though Jackrabbit-quarterback Junior Nolan McDonald scrambled and threw his way to an 82-yard scoring-drive that culminated with a 13-yard touchdown run/scramble with 22 seconds left in the game to deliver a last-minute victory to his team, it would probably be best to say that the Gauchos gave the Jackrabbits all-that-they-could-handle for the better-part of the entire 4 quarters. The Gauchos in-fact LED for most of the game and if it were not for a blocked punt/special-teams fiasco that resulted in a touchdown for the Jackrabbits the Gauchos might've put-the-game-away-for-good in the third-quarter when they marched down the field and scored their final touchdown. Gaucho players like AJ Luuga, Alex Tauanuu and Boe Tufele kept the pressure on the Jackrabbits throughout the course of the game and kept McDonald and company from making big plays in the middle of the field and kept the Poly running-game from establishing anything consistent. The Gauchos next game will be next-Friday when they go to meet Palos Verdes High. Lemalae was able to attend the Samoana Golf Association fund raising golf tournament for the Samoan flag day not as a player but as a cheerleader. This tournament was held at the usual home park of the Samoan Fu'a every year at Victoria Park, Carson, CA. There were players from the San Diego Association and the Sacramento Association, Ca. At the end of the day, everyone met up for dinner and good music at the President Ulis home. After dinner, President Uli of the Samoan Association Golf team together with some members of the golf team delivered their gift of $2,000.00 for the event to the president of the Los Angeles Samoan Flag Day. President Pele of the Flag event excitedly comment "Oh good, we will give $1,000.00 to Saluafata and another $1,000.00 to other expenses. After the presentation there was food and mingling between the participants which included Doug Alii Slade from Utah. 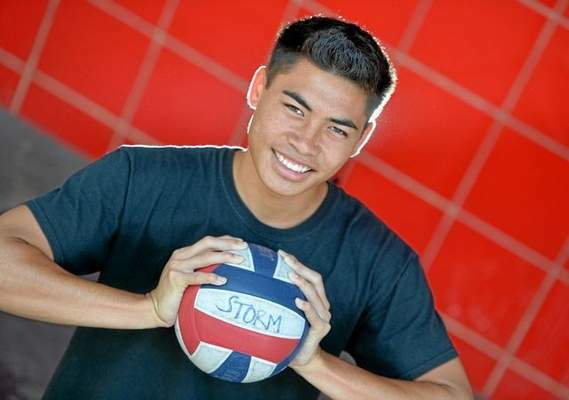 Lakewood volleyball player Storm Faagata is the Press Telegram's Dream Team Player of the Year in Long Beach CA. on Tuesday June 24, 2014. (Photo by Sean Hiller/ Daily Breeze). It would have been easy for Lakewood senior Storm Faagata to grow frustrated with his senior season as a Lancer. The top talent in the area was on a team that didn’t always fully support his talent, as Faagata had three separate 40-kill matches that ended in losses. But the BYU signee said that was never the case. He certainly was that. The first team All-CIF and co-Moore League Player of the Year led his team every time they took the court, as Lakewood head coach Devon Taylor said throughout the season he was aware that his team needed Faagata to be at the top of his game every night. “We don’t have as many hitters as (eventual Moore League champion) Poly, so Storm has to be great every match for us,” he said. Faagata is a phenomenal power hitter, part of why he received his offer from BYU, the two-time NCAA champion program that has been to the NCAA Final Four each of the last two seasons. But Faagata, a unique talent, also has a unique story—before traveling to enroll in college in Provo in 2016, he will travel to…well, that part he doesn’t know yet. Faagata is a member of the Church of Latter Day Saints, and will leave this fall to serve a two-year mission before he resumes his athletic career. Faagata said he will run every morning during his mission, and will squeeze in workouts when he can. The senior is no stranger to international travel, having spent a year in Samoa twice already during his lifetime. He stands on the brink of a bright future—he’s not yet sure where his next two years will be spent, but he’ll be a BYU Cougar in 2016. As for now, he’s the Dream Team Boys Volleyball Player of the Year. It was a special year for the Gahr boys volleyball team, as the Gladiators went 26-6 overall and made a run to the CIF-Southern Section championship game in Division 3, their first title appearance since 2000. It was perhaps an extra special experience for their coach, Iris Najera, who knows what it’s like to play in the Gahr colors as she once did so herself, helping lead the Gladiators girls volleyball team. After that, Najera played for Long Beach State, and shortly after graduating was hired at her high school alma mater as a teacher and coach. The junior standout power hitter for the Jackrabbits had another breakout season this year, leading the Jackrabbits to a 30-6 overall record, a Moore League title, and a quarterfinal appearance in the CIF playoffs. He’ll have to lead a Poly team depleted by graduation next year, as the area’s top returning player. The top outside hitter for the Buccaneers was also the best player in the Suburban League, winning league MVP honors for the second straight year—this is also his second year as a Dream Team first-teamer. Canlas helped lead Bellflower to an undefeated league championship with 261 kills on .332 hitting in his senior season; he was also an All-CIF honoree. The senior leader Lourenco—also a first-team All-CIF selection—was the leader for the Gladiators throughout the playoffs. The do-everything captain had a run of four straight aces in a semifinal win, and was as skilled on the back line as he was on the net. A Dream Team honoree last year as a sophomore, Thompson continued to develop into his junior season. The six-foot-three outside hitter put up big numbers in 2014, leading his team with 284 kills on .277 hitting. He also led the Griffins with 24 aces, and 137 digs. Unfortunately for Southern California volleyball fans, Tuioti-Mariner’s skills on the gridiron are going to arrest a promising career at the net. The Brave has signed with UCLA as a defensive lineman, but he was one of SoCal’s best power hitters, and was the area’s only Division 1 All-CIF honoree. He was a Dream Teamer last year, as well. Gahr may have been the SGVL team to make the most noise in the playoffs, but it was actually the Warren Bears who claimed an undefeated league title. Velasquez—a first-team All-CIF honoree—was the area’s best backstop at libero, and led the Bears this year with his defense. The senior was also the SGVL’s Most Valuable Player.